Welcome to Hands on Health-SC for Kids. This section of Hands on Health-SC is for you. Get answers to your own questions about health, exercise, sports, and good eating habits. Explore neat sites for games, project ideas, and help in science, math, spelling, and other subjects. 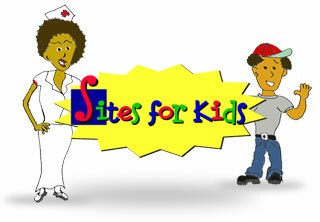 Designed for kids 9-13 years old, this site gives you the information needed to make healthy choices. The site uses topics that kids suggested — such as stress and physical fitness — using kid-friendly lingo, games, quizzes, and other interactive features. This site also provides teachers with interactive, educational, and fun activities that are linked to the national education standards for science and health. The National Library of Medicine has provided a whole page of links to fun and educational Web sites about health and science. Find general health sites, anatomy sites, dictionaries, coloring books, and games. Many of these sites are also in Spanish. This is a collection of links that Hands on Health – SC has gathered especially for kids. Learn how your health is connected to the environment through games, videos, and other fun activities. You may even get some help with your homework. This information Web site for children designed by Information Please, was recognized as Best Kids' Site by the International Academy of Digital Arts and Sciences in 2001. Their purpose is to provide a safe neighborhood on the Web for children 3 to 12 years old and their families. In the Science/Body section, there are topics about the body, explaining how all the different systems work. There are sections on different types of doctors, folk food cures, healthy habits and bad habits, illnesses that kids get and other special topics. The Food section also has many different interesting areas. You can link to other fun areas and reference tools for kids (atlas, almanac, encyclopedia, and dictionary). This website for children gives tips on how families can be prepared for a disaster. There is a section for games, as well as one for parents and teachers. The National Women's Health Information Center provides girls with information about fitness, nutrition, illness, mental health, relationships, safety and much more. It also offers free eCards, letterhead, a Survival Guide, Buddy Icons, and wallpaper. On this site, you will find safety tips, health information, games, and contests. This health information Website is a service of Children, Youth and Women's Health Service of South Australia. Topics were selected by children and reviewed by children. Though it was developed by Australians, it is for children all over the world. Kids' Health is a site sponsored by the Nemours Foundation, whose mission is to improve the health of children. A medical review board reviews all material. There are sections on staying healthy, common illnesses, dealing with feelings, growing up, understanding grown-up diseases, and medical terms. There are also games and recipes. The FDA (Food and Drug Administration) operates this site. Information is given in a fun and interesting way about food safety, vaccines, cosmetics, tattoos, and other health topics. There are games, quizzes and puzzles. Kids.gov links over 2,000 Web pages from government agencies, schools and educational resources, all geared to learning interest and level of kids. The websites are divided into subjects such as math, arts and history. The Department of Agriculture created this fun site to help children learn everything about food. Here you can learn about nutrition and how to prevent foodborne illness. You can also learn how to grow your own food and how top join a 4-H Club. This site has lots of educational and fun activities about health and the environment. Sections include Games and Activities, Story Time, Sing-Along Songs, Brainteasers and Riddles, Hot Topics, Careers, and Projects. Select Other Cool Links and Resources for more fun science sites and games. It also has some environmental justice content. The NEI's website for kids. Learn about the parts of the eye, eye safety, and how we see. Read, play games, or print. Learn why sleep is important to your health and safety, what happens while you sleep, and how you can sleep better. Learn about dreams and nightmares. There are also fun games, puzzles, and a PJ Bear Booklet.